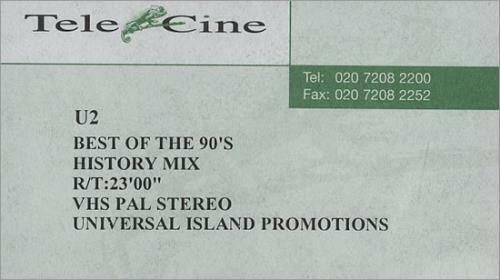 U2 Best Of The 90's - History Mix (2002 UK promotional PAL video of the bonus to The Best Of 1990-2000 album. Features a montage of tracks and performances from a decade that brought us Actung Baby, Zooropa, Pop and All That You Can't Leave Behind. With custom printed Telecine sticker labels, runtime 23 minutes).